BEFORE YOU CAN GET THE “CORNER OFFICE,” YOU MUST GET CLEAR ABOUT WHAT YOU WANT FROM YOUR CAREER. A Powerful Career Management Model to Move Women into Executive Leadership. As an aspiring woman leader, you must ask yourself tough career questions and be bold enough to hear your answers. It’s easy to say, “I want to be in a leadership role; I want to be in the Executive or C-Suite.” Every woman knows that few are chosen and even fewer advance. In this powerful life-changing book, executive coach Margaret Spence asks high-achieving women 52 provocative questions to clarify their career and leadership vision. Leadership Self-Transformation isn’t about changing who you are. It is about aligning who you are with what you do. Question #4: What would you say your career is preparing you to do? Question #6: Are you loyal without a reason for your loyalty? Question #10: What are you afraid of? Question #18: What connects your passion, purpose, and value? Question #35: Who are you without the label of your job title? The most pivotal question in the journey, “What if you could find the power and the limitless courage to build the career you want?” Maybe what you’re asking for isn’t what you want. Maybe what you want isn’t what you’re asking for. Every question hits at your core values and helps you define your personal career choices. 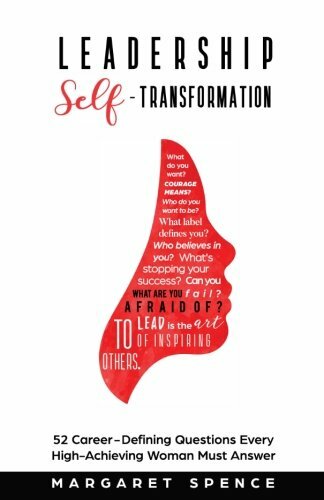 Leadership Self-Transformation is the inner work women must do on themselves in preparation for the next level of career advancement – it’s the career coach you always wanted to help you prepare a path to success.